Similar to wine buffs, coffee aficionados are fanatics about the roasted bean. These folks are extremely passionate (read borderline freaks) about their coffee … and since coffee fanatics typically spend in the $4 range for a grande Starbucks (or other coffeehouse), this passion can get EXPENSIVE. And that’s where CoffeeNut comes in … this nifty little app conveniently tracks your coffee intake throughout the year … so not only will you be reminded of your massive caffeine intake, but at a glance you will see the excessive amount of money you spend on coffee. Let’s see … 250 work days a year, $4 per grand Starbucks … $1,000 per year … hmmm, how about we take that $1,000 per year, invest in a financial instrument that yields 4% … in 10 years our ending balance would be nearly $12,000. Great CoffeeNut, you’ve managed to depress the KRAPPS out of me and I haven’t even installed your app yet. I’m not exactly sure of the purpose of this app … to inform? – to calculate? – to encourage? – to depress? – to piss you off? Better idea … why not re-launch CoffeeNut and re-position it as a “Cost Of Drinking Coffee” calculator, with the goal of encouraging individuals to break their coffee drinking habit. Makes cents (pun intended). There are plenty of quit smoking calculators … American Cancer Society and American Heart Association to name a few. The whole caffeine thing is not exactly healthy. 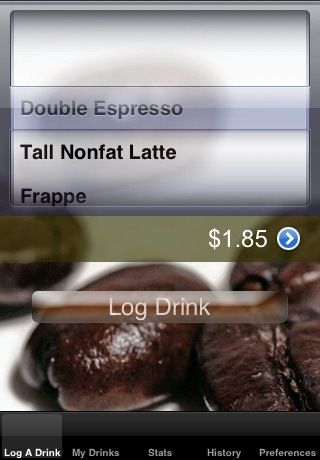 Call it “CoffeeBreak” … your handy little app to help you beak that nasty coffee addiction.